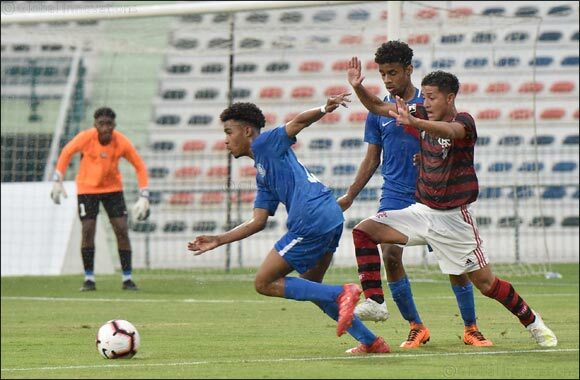 Dubai, UAE, April 14, 2019: Defending champions Flamengo are through to the semi-final of the 9th Dubai International Football Championship U16 following a 3-0 win over Al Nasr on a rainy evening at the Maktoum Bin Rashid Stadium in Al Mamzar. The Brazilians, who blanked Atletico 4-0 in their opening match, scored all three of their goals inside the first 34 minutes of the game on Saturday, with Joao Pedro Da Cruz giving them an early 6th minute lead. Pedro Henrique Fonseca Martins then made it 2-0 in the 22nd minute and 12 minutes later, Kaky Brum Veloso added a third to Flamengo’s tally. In the second match of the day, Atletico bounced back from their loss against Flamengo to drub Hatta Club 7-0, with Marcio Vidal, Jose Maria and Lucas Serrano scoring two goals apiece, and Samuel Hernandez one. Atletico will now face Nasr in their final match of Group B on Monday with a draw being enough to take them through to the last four. An Al Nasr win will, however, see the Spaniards return home early and the Dubai club, who drew 2-2 with Hatta in their opening match, will be playing for a place in the final instead. Shabab Al Ahli also have a chance of reaching the last four, despite their 4-0 loss to Al Hilal, who have confirmed their spot in the semis from Group A. The Dubai club, who have three points, need a draw against Borussia Dortmund to make the grade. The Germans, who have one point, need a win to progress. Group A: Al Hilal FC beat Borussia Dortmund 3-2; Shabab Al Ahli FC beat Al Wasl FC 3-0; Al Hilal FC beat Shabab Al Ahli 4-0; Al Wasl drew with Borussia Dortmund 2-2. Group B: CR Flamengo beat Atletico Madrid 4-0; Al Nasr FC drew with Hatta Club 2-2; Flamengo beat Al Nasr FC 3-0; Atletico Madrid beat Hatta Club 7-0.